SparkLabs, a network of accelerators in Asia, is launching in Taipei after recently launching in Beijing. The first accelerator was launched in Seoul in 2012 with 79% of its 74 graduates receiving follow on funding and over $195 million in venture capital. SparkLabs has expanded to Songdo, South Korea with an IoT & Smart City accelerator, Beijing, and early next year a FinTech accelerator in Hong Kong. Edgar Chiu has joined SparkLabs Taipei as the Managing Partner who will oversee its operations. He was previously the COO of Gogolook where he was responsible for developing global partnerships in Japan, Korea, the Middle East and Southeast Asia for the Whoscall app, a global caller ID service which accumulated more than 50 million downloads. Gogolook was subsequently acquired by Naver (Korea’s leading Internet company with a US$24.4 billion market cap) in 2013, and Edgar took on the role as the founding General Manager at Camp Mobile Taiwan, Naver’s mobile group. SparkLabs Taipei will target startup companies in IoT (Internet of Things), AI, VR/AR, mobile, fintech, healthcare, and others verticals. The mentorship-driven program will be three months in length and will provide funding, office space, a structure program and access to a top-tier network of entrepreneurs, venture capitalists, angel investors and executives from Silicon Valley and across the globe. “I’m estatic that we were able to recruit Edgar to head up SparkLabs Taipei. From his experiences at IBM and Gogolook, which was one of a handful of successful exits in Taiwan. He’s perfect to help the founders utilize SparkLabs Taipei to scale and impact Taiwan and beyond,” explained Eugene Kim, a partner at SparkLabs. Edgar is joined by two Venture Partners, Alex Wu and Tony Ling, who are part-time partners. 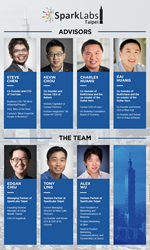 Alex and Tony will be providing support to SparkLabs Taipei’s startups and sharing their experiences from Silicon Valley. Alex is the Vice President of Marketing and Communications at Newsela, and was previously at Quora, Facebook and Obama for America. While at Facebook, he was a product marketer where he managed over $50 million in media placements, accelerated adoption of products like Facebook Pages and Facebook for Android, and led global marketing initiatives with Facebook's mobile operator and device partners. Tony Ling is a former Managing Director at Silver Lake Partners, a technology-focused private equity firm with $39 billion under management. While at Silver Lake, Tony led investments across a range of technology sectors including internet, semiconductor and hardware-related companies. Steve Chen, Co-founder and CTO of YouTube, and Kevin Chou, Co-founder and CEO of Kabam, join SparkLabs’ entry into Taiwan on their advisory board. Steve sold YouTube to Google for $1.65 billion and Kevin recently sold Kabam to Netmarble, a South Korean online gaming company, for $800 million. Also joining are Charles and Kai Huang, the two brothers who sold Red Octane (Guitar Hero) to Activision. Guitar Hero was the fastest video game to reach $1 billion in sales, and was the best selling video game in the world in 2007 and 2008.